It is with a heavy heart that I have taken the decision that it is time for me to pass on the mantle as promoter and benefactor of The Lakeside Hammers. At times I have felt like Canute, seemingly facing every conceivable wave that battered us and stood in the way of achieving much desired success for the club. Jon Cook always said to me that we are merely custodians of this great sport, and if the time comes when I can no longer protect nor progress it, then that’s the time to let someone else have a go. I have done as much as I can, at great personal and emotional expense, to raise the honourable name of The Hammers. Together we have had some great times, even through some really dark days, and I will treasure those memories. I remain committed, however, in the pursuit of my ultimate objective, which is to obtain a facility for speedway in my home county of Essex, and to that end, I will continue to facilitate and support the work of Mark Sexton and the Hammers committee, along with the desires of Thurrock council, to make that dream reality. The events of this year have proven a step too far for me, with the forced relocation to Rye House determining whether we would be able to keep racing. 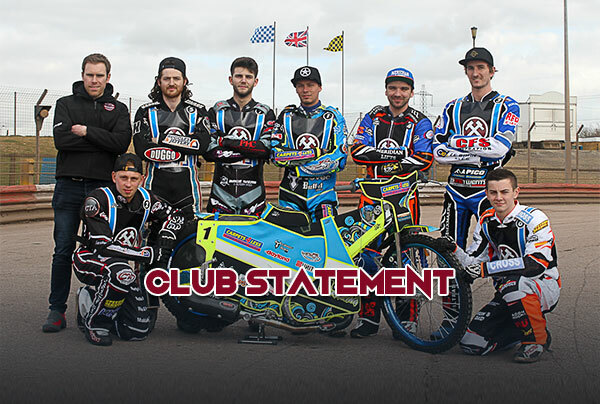 I remain extremely grateful to the Rye House owners for allowing us to at least finish the season’s fixtures – a facility that was not extended to us by Arena. It wasn’t quite the finale I had in mind, and it may well have been different had we been able to complete the campaign at our home track. This team, this year, has been one of the most exciting teams I’ve ever seen in the crossed Hammers, and I am grateful for their all out determination to battle on through constant adversity. They nearly achieved our joint aim of winning the title, too. They deserve our respect and gratitude. It is my intention is to put my license on ice whilst we fight for the new facility in Thurrock, and whilst I can’t say what the next few weeks may have in store, I am looking at all the options currently open to us, including third party stewardship, if the right person were to come forward ahead of the BSPA AGM on 12th November. If this IS the last time we see the Hammers race for a while, I look forward to seeing you all again as soon as we can, in a new place in Thurrock we can call home. My thanks, as ever, to the dedicated, loyal, generous, incredibly hardworking volunteers who keep this club running. To ALL the riders, our sponsors, and to Jon Cook, who takes the weight of everything from everyone. Most of all, I want to thank you, the fans. You have been amazing from day 1 – I’m just sorry I could not bring you a league title.